To silence the awkward conversation, let’s continue the spirit of generosity that Ramadan instilled in us, and reap the rewards we attain as we smile with kindness every time someone asks for a donation. Have you wondered if the poor and needy get the same generosity post Ramadan? How does the organisation we trusted with our zakat and sadaqa during Ramadan sustain itself post Ramadan? 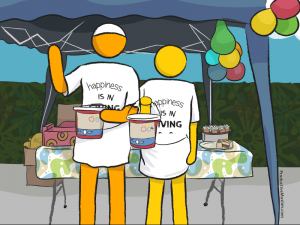 Do you continue to lend a helping hand to the cause you have supported during Ramadan? Each one of us can play a positive and productive role to tackle the roots of poverty throughout the year. If you have ever attended a charity dinner and become so emotional during the course of the event that you instantly raised your hand pledging to raise a large sum of money for a good cause, then this article is for you. Here is a list of tips that will assist you in becoming an effective fundraiser Insha Allah. If you already are a fundraiser, please feel free to share what has worked for you so we can make a difference together. Every deed begins with an intention and since fundraising is a noble deed, ensure your heart and all faculties are present. Once you make the intention, rely solely upon Allah to shower your efforts with Barakah and recite a prayer to Allah . Make it a habit to say Bismillah when asking for funds, when accepting donation, when counting, when registering, when seeking a charity to support etc. Saying Bismillah will help you to handle disappointment during the early days of your fundraising efforts, when you don’t secure donations as well as handling praise when you reach your fundraising target. This is really important but don’t spend too much time planning as it does not need to be a laborious process. Ensure you have fun making this plan. Note down the names of the charities you have recently supported, or the causes that are close to your heart, e.g. water, food, environment, orphanage, medical conditions etc. How much time can you contribute to this fundraising? Where is the charity based? Is there any cost involved to this fundraising? Do you need to include marketing strategy to your plan e.g. poster, profile header etc? What case studies will you be using? What photos will you upload to help your appeal? Once you are happy with your plan, review it, and then ensure you act upon it as you will attain a sense of fulfilment when you accomplish the end results. What resources do you have available to assist you with fundraising? i.e. computer, Internet, social network, fundraising online page. Is the charity you have decided to fundraise for registered on online fundraising sites? i.e. Justgiving, virginmoneygiving, etc. Find out from your charity who they are registered with and if they are, then make your page, share it with friends and family and raise money for your charity. Make sure your fundraising page is compelling and explains your motivation. Study the fundraising tool very well; check all the resources it can provide you with. For example, does it enable your friends to text donate, can you add video blog etc. If you receive donations offline, check if you can update it on your page too. Learn about the charity that you are going to support. Read about the appeal that you are supporting. What is the charity’s admin policy? What is its registration number? What was its previous year’s progress report like? Attempt to understand the FAQ that the charity lists on its site. Note down the charity’s basic details and have it ready with you at all times. When you fundraise for a charity you become its ambassador. If you feel you have not mastered the art of asking for donations then seek help from the charity. Inquire whether it organises or conducts training days for volunteers to boost your confidence using online tools or even offline methods of securing funds. The basis of all this is knowledge. Potential donors will expect you to have answers to their questions. There is no harm if you don’t, assure the donor you will find out more details for them and update them. Communication is crucial and every question can lead to potential donations so don’t leave a query unanswered. Don’t forget to ask for Gift Aid as it means more money for your charity. The charity you have chosen to fundraise for may already have sponsored walks, runs, cycle tours or other creative ideas listed on their website, so check them out if you haven’t already decided on an idea in your plan section. Please ensure you do not divert from the purpose of fundraising. Fundraising challenges are there to enable you and boost donations. Successful fundraising is not about asking for donation only but also it is about building a platform to give people the opportunity to participate in a worthy cause. If you are going to get involved in sponsored events such as walks, etc., ensure you start fundraising early, so that you maximise donations from friends. Fundraising sometimes enables us to renew relations with friends and family members that we have not been in touch with for a while. So renew your intentions and use this opportunity to strengthen ties. Remember, you cannot make someone donate. Fundraising is meant to gain you friends not lose them. Communicate what your fundraising target is and what their contribution will help achieve for your charity. Fundraising is only for a short period, which ends when you have reached your target. So create a culture of fundraising in your home, join up with friends and get colleagues involved. Everyone can participate in your fundraising. Hold a meeting with all the people who are going to support you and enable them to envision how the outcome of your fundraising will be. Motivate, empower and you will eventually inspire someone. It will be amazing if you articulate how much fun you had in your fundraising efforts, if the donors who donated to your cause become fundraisers themselves. You can benefit from everyone’s network, friends of friends, colleagues etc, before you know it everyone has heard about your fundraising story. Ensure your fundraising has a story; the best marketing method, even in 21st century, remains word of mouth recommendations. Speak to your charity and get a case study or a story of someone in great need to bolster your fundraising appeal. An empty fundraising page with 0 donations tends to be intimidating. Encourage your friends and family to donate first before reaching out to others. Donors tend to match the amounts already listed on the fundraising page. So speak to your family and friends to help you with some generous donations to get the Barakah rolling. Fundraising has never been more fun. Maximise your fundraising efforts by using your social media platform such as Facebook, Twitter, YouTube, blogs etc. Encourage your friends to donate a tweet and a post using their own words and uploading the link to your fundraising page. This will attract a wider audience to your page, ultimately increasing the chances of reaching your target. According to Just Giving, tweeters give the highest-value donations of any social media users, donating an average of £30.26. So ask your followers to RT your post, but don’t overdo it and risk losing followers. If your fundraising is subject to a deadline and event date then create an event page with global location, so everyone, irrespective of location, can donate to your page using secure methods of payment. Also ‘like’ the charity you are supporting and tag them in your status when you are posting to your page. Get in touch with them; see if they can spread the word on their fan page, twitter and website. Perhaps they can write about your efforts in their monthly newsletter. Remember you are a fundraiser. That is a job and you need to think of ways of raising money, even in your sleep. So live the role, change your Facebook profile to Fundraiser, update your Twitter bio to Fundraiser and add your fundraising page under the website section. Update your e-mail signature so it captures all your fundraising details. If you have a blog, write an article about your fundraising and tag the relevant tags. Fundraising requires dedication and patience, and because you will need to fundraise 24/7, I recommend you register with Hootsuite to manage your tweets and Facebook posts. Yes it is free! Schedule all your posts so you can go about your business and commitments, knowing your fundraising is taken care of. Fundraising requires a great deal of patience. People will promise to donate, but when and how is subject to their convenience, not yours. Nevertheless, learn to be persistent; they mean to donate but may need another reminder. Charity is a blessing, so there is no harm in sending another email or text. However choose your time wisely. When you have planned for your fundraising, done all the hard work it entails, then raise your hand and make dua that Allah puts blessing in your work. Adhere to the etiquette and the golden time to make dua. When someone has donated to your page, ensure you send them a thank you note. Most fundraising sites enable you to personalise your thank you message. You must strive to receive donation for your cause on a daily basis. If you are not receiving donations, then please refer to tip one. Renew your intention and say Bismillah. Fundraising also brings the journalist in you to life. Learn to post regular updates on your progress and how the current donation raised restores hope in someone’s life. For example £60 feeds a family in Africa for a month. Regular updates remind people to return to your page and inspire them to donate again or to recommend your page to their friends. Give feedback to your donors and supporters to assess how their donations made an impact. You will need to keep in touch with the charity you have supported to get a hold of the progress report; use this to give your page one final update.